Established recently (2006) in vineyards at the foothills of Fruška Gora in the village of Krčedin in Vojvodina, Kuća vina ("the house of wine") Živković is fully dedicated to quality. After a lengthy period of search for the perfect land spot, the best land was chosen, the best vines, best tools and most importantly the best domestic experts. 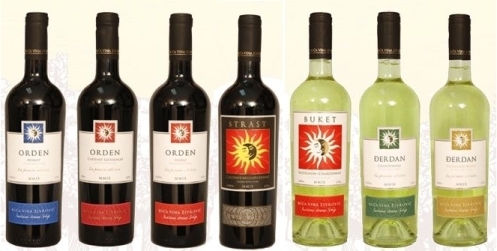 All this with an aim to create Serbian wines of superb quality. The mission of the winery is to show the sunny side of Serbia, both to the world and to the domestic public. The vineyards extend on over 40 hectares of land, with Cabernet Sauvignon, Merlot, Syrah, Sauvignon Blanc i Chardonnay being raised. Prof. dr Nebojša Marković, a profesor at the Belgrade University is taking care of the vineyard yields and the enologist Milorad Cilić is encharged of the vinification process. The winery produces the "Orden" array of varietal red wines, Orden Cabernet Sauvignon, Orden Merlot and Orden Syrah. "Strast" (passion) is a blend of Cabernet Sauvignon, Merlot and Syrah. "Đerdan" are varietal white wines, Đerdan Chardonnay i Đerdan Sauvignon Blanc, while "Buket" is a blend of Chardonnay and Sauvignon Blanc.